Over the last seasons, quite a few people have fallen in love with Barcelona, Spain and FC Bayern’s tiki-taka brand of football. After Guardiola’s departure to FC Bayern, we’ve seen the Bavarians employ a mix between the more direct style Heynckes implemented and Guardiola’s own possession-based style. Either way, possession seems to be crucial, as its importance is preached ad nauseum. Now I am not blind to the importance of possession, but sometimes keeping the ball just isn’t enough to break down a well-organised defence. The problem with possession is that, while having the ball is certainly more desirable than not having it, you force the other team into sitting deep in a low block defence. This is the bane of possession-orientated teams such as Barcelona and Spain and to a lesser extent, Pep’s FC Bayern. Breaking down such a team requires a different approach and in this case, I’ll be honest with you. @JLAspey‘s recent work on the Tactical Annals has been nothing short of inspirational for me. I quite enjoyed reading about his exploits with a 4-4-2 formation and I started thinking of putting my own spin on 4-4-2 formations, naturally adding a strikerless twist. In this particular case, I decided to merge my own strikerless antics with a few pages from the Tony Pulis playbook. I really enjoyed the relative simplicity of the 4-4-2 formation his teams employ and their direct approach to football. The way Pulis lets his teams play is basically a sort of Occam’s razor theory of tactics; keeping tactics simple could be perceived as a the best way to approach a football tactic. That’s not to say Pulis’s teams don’t have a strategy, it’s just not quite “thump the ball down to the big man” full stop, but a bit more nuanced. In setting up this tactic, I am not striving for a complete replication of Pulis’s work. Instead, I am opting for a synthesis of old and new, of brawn and brain, of long, direct passes, more intricate passes, and an amalgamation of the ideas that work for his teams and the ideas that make a strikerless formation tick. Basically, I want to try to rectify one of the greatest misconceptions about direct football; that it represents an absence of thought, a lack of method, a kind of footballing savagery, robbed of aesthetic merit. I know this makes me sound like a self-aggrandizing prick, but when you look at some of these match clips, I am sure you will agree that it’s both direct and quite appealing to the average armchair-supporter’s sense of aesthetics. So after this rather long and winded introduction, let’s get down to business by looking at the actual tactic. Truth be told, this isn’t a very complex tactic. In the AM-strata, you can see the classic big guy targetman, fast guy runner combination. The AM(A) is tweaked to the role of our Withdrawn Targetman, whereas the Shadow Striker runs into space after through balls by nature. Crosses will be coming in from the flanks, from either the wingers or the complete wing-backs, whereas the deeplying playmaker tends to whip in the odd long ball as well. In all cases, the box-to-box midfielder tries to get inside the box as well. This straightforward approach to things is reflected in the team instructions as well. Direct passing, a wide formation, high tempo and a disciplined approach make for a highly energetic, cohesive team, which tries to get the ball into the opposing box quickly to try and score goals. Naturally, I’ve incorporated several set piece routines into the tactic as well, including a Delap-styled throw-in routine I wrote about earlier. That pretty much concludes the whole tinkering with settings process, which leads me to the part you probably all came here for… The download. I’m a big fan of your blog, but I’d just like to say that Pulis’ system is more based on the ‘low block’ deep zonal marking scheme. Having watched both his Palace and WBA sided this year, there is very little pressing apart from the front 3 and each man has a very distinctive zone which he is in charge of. Also they tend to defend deep allowing the other team to have possession. It should be noted that I am an Arsenal season ticket holder, so both of these matches were probably even more highlighted due to the opposition. I was wondering if your proposed system was actually more similar to Simeone’s Atletico, who revel in defensive football but are much more dangerous in open play. It’s not a 100% Pulis style tactic, since I do love my high block defending hehe 🙂 Still, it’s inspirational to see his teams play. It probably is more similar to Simeone, but that would probably increase the hipster level too much if I called it that. This has more of a retro vibe to it haha. 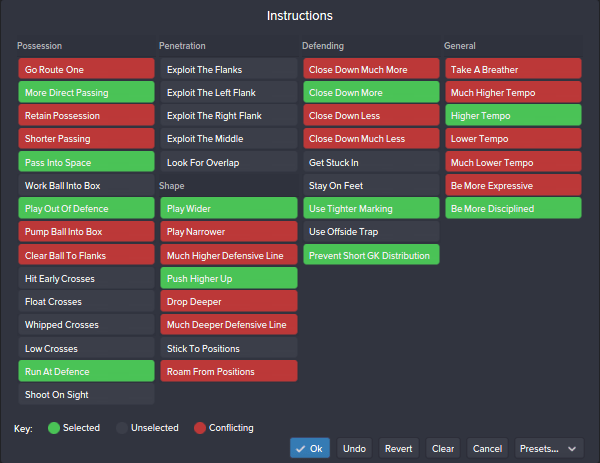 is there a version of this tactic for fm16? Not yet, but I can make one. – what do you think they are correct player stats are good for a make a ccorect gegenpress? (im think about workrate,teamwork,stamina …) one that is essential? – You think it’s possible to get a success strikerless tactic without using too many PI’s? Thanks for taking notice and following Strikerless. Don’t worry about your English man, it’s just fine and I understand what you’re saying. I’m not a native speaker myself, so who am I to criticize someone else’s linguistic skills? As for the questions you asked… I reckon you need players with high work rate and stamina for sure, a healthy dose of aggression, decisions and determination also wouldn’t hurt. I realise this means you need pretty classy players, but it’s only relative to the division they are in. You don’t necessarily need world class players, just players who are at least average with what most of the division you’re in is using. I am definitely in favor of using as few PI’s as possible. In my own tactics, there’s generally only a few players with a lot of PI’s. The Withdrawn Targetman and Central Winger roles are generally the only ones. So yeah, you should be able to get one working without really heavily tweaking every player role. I hope that helps, but if there are anymore questions, just ask away. in my save just promoted to eredivise with “de graaschaap” with a strikerless 433 similar at one of your tactics, but no the same , thanks a lot for your time ! youre so so great ! You’re welcome. Good luck with De Graafschap. Hi, there! No need to say how awesome your work’s been, it’s apparent! Now, the question. Do you think your strikerless tactics, including this one, could work in the depths of lower leagues, specifically Conference N/S in England, lowest of the low in FM. They are all attacking or overload in mentality, requiring a lot of running and high tempo plays. Have you tried it with REALLY bad level of players (relative to the league, of course)? I played with it in the German Regionalliga’s and did well, so I reckon it could work in the Conference. Did you do anything to preserve a lead during matches? You can drop the defensive line and play a counter or control mentality. How often do you generally react by going a bit defensive? Wouldn’t counter drop them too deep, i.e. too far away from goal in order to counter effectively? Sorry for all the questions, btw., I’m just interested in your way of approaching the game beyond the initial tactic. No worries, if I minded those, I’d be a crappy blogger haha. To answer the question, it really depends on the match. If I have the idea the opposing team has superior players or fitness and is pushing me back, I tend to drop deeper to soak up the pressure. I can’t really say how often that happens. So do you recommend control or counter when doing that? Yep. Combine with a narrow shape and a deeper defensive line. You could even tick the possession shout, grind the match to a halt. Depends on what your players are capable of. I started out with formations like that in FM12 or FM13. The wide setup isn’t ideal in FM. So I came across your blog as I sink deeper into the depths of FM obsession and was immediately fascinated. After a while of reading I decided to do a test save to see how this strikerless Pulis stuff actually felt, and was sold immediately. 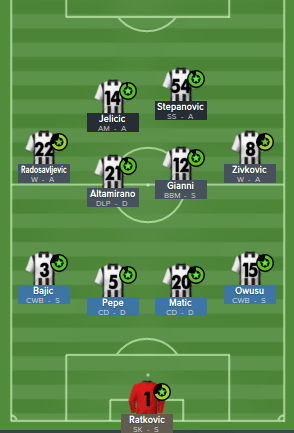 So now I am starting a fresh save to build my own team with and I have basically every position planned out with the exception of the target man. What would be the best way to go about training up a youth player to fill that role? I am playing as Wolves and currently planning to use McDonald for that spot, but there is a youth player that I feel will be great in that role with a little re-training. The problem is he is a winger, and has neither striker nor AMC as positions he is familiar with playing. I am just curious what you think would be the best way to go about training him for that future role. Would it be better to just train him to do the AMC position first, then work on his individual stats? Or train him as a striker and then target man on a heavy training load, then switch him to AMC further down the line. I am pretty new to FM so maybe the answer is more obvious to somebody that has a clue what they are doing. I feel like I have all the other positions pretty well planned out because the training for those positions seem like they would be much more straightforward (ie. a shadow striker has very similar stats to a number of other positions and it seems like it would be easy to convert a player to that role). Anyway, highly enjoying your blog. Start the training simultaneously. Re-train his position and start training him role-wise. Keep the schedule normal whilst you re-train both. Once he is more fluent in the position, remove the positional re-training and just focus heavily on the role training.